Have you ever wondered what happened to that one missing sock? 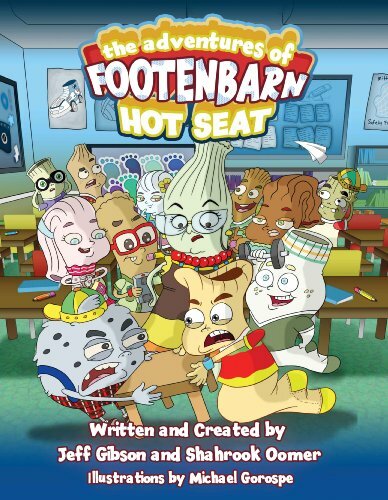 The Adventures of Footenbarn – Hot Seat (Paper Press Books), written and created by award-winning feature film producer Shahrook Oomer and award-winning television producer Jeff Gibson answers that age old mystery and has been a hit so far with parents and kids and is stirring the imagination of children everywhere. Hot Seat is the first in a series of five books (also being developed into an animated television series), about a world of ‘lost’ socks and other missing garments. Set in Sockramento, the authors, drawing from their experiences in film and television, have created one of the most hilarious and original children’s books of the decade. Spoofing pop-culture and mixing comedy and adventure, it’s a ride-of-a-lifetime read for parents and children alike. Meet Footenbarn, a ten year-old mischievous but lovable sock, and his four best friends who have all disappeared through a worm hole in the spin cycle of the dryer, and who come to life in Sockramento, where the top TV show is “Socks and the City” and the New York Sock Exchange is a bustling financial hub. Buses look like sneakers, apartment buildings are actually chest of drawers, washing machines are office buildings, while high rise buildings reach to the sky in the form of boots. Hot Seat follows the comical duel between Footenbarn and Smackberry – a giant ball of lint, as they first battle in the old west town of Sockwood (a spoof of the old Spaghetti Western), and then continue their battle across Mrs. Pigsnockle’s 4th grade English class in order to sit next to the ‘new sock in school’ – only to learn that sometimes the grass isn’t greener on the other side of the classroom! No two socks are alike in Sockramento (as we know from experience, only one sock of a pair ever goes missing); they come in all sizes, shapes and ethnicities and are totally mismatched! This is a one-of-a-kind world that’s been ‘socking’ in parents and kids alike. From Flex, the muscle-bound school jock, to Franci Pants, the French foreign exchange sock, each character is unique, funny and always ready to help their pal Footenbarn. The book was written not only to entertain children, but to make reading the book fun for parents as well. Along with 42 pages of color illustrations in a large 8.5 x 11 format, the book retails for $9.99, a price the authors insisted with their publisher, so that the book would be affordable for everyone. The book’s website features a totally interactive experience, in which users can swing characters across a clothespin line and see the sites and sounds of the hustling bustling city of Socramento. Plus see a sneak preview of more Footenbarn Adventures. Writer, producer, and recipient of several industry awards, Shahrook Oomer began his career in radio at the age of 17 and went on to write and produce broadcast television for FOX Cable Networks and eventually producing feature films in Hollywood. Writer and producer Jeff Gibson is the recipient of over thirteen major broadcast awards for his writing and producing work, including multiple Emmy Awards, Katie Awards, Telly Awards and Associated Press Awards. For more information on the book, please visit: www.footenbarn.com.